Translating and recording text in foreign language for commercial purposes. 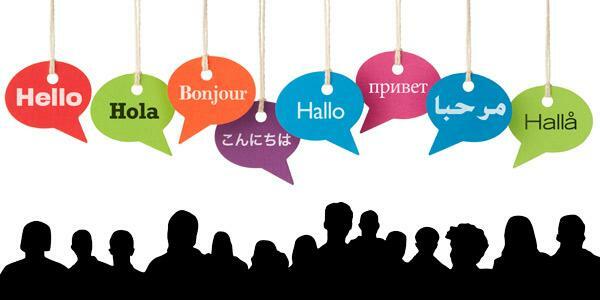 Using foreign languages for communicating clients and other businesses in the era of globalisation has become a key factor in pursue to success. All would like to speak many languages but... not everyone does. Some speak one or two foreign languages, polyglots speak more, but what to do if you need a professionally recorded text in a language you are not acquainted with? You could employ an interpreter for the language, followed by employment of a speaker (at best a native-speaker) but since projects are typically constrained by their budgets we would advise looking for a cheaper and more practical alternative. Having searched through the Internet I haven’t found any solutions for direct conversion of text in one language to speech in another. So I decided to cut the job into separate parts and use popular tools to get it done. I have called them “IVONA Translator”. As you may already know, at translate.google.com there is a tool for translating text to one of many languages. Entering or pasting text and choosing the language may be a matter of seconds. The translation may not be ideal but still sufficient for most purposes. Usually the translation carries the meaning of the original text. And besides, the translation may be improved by an interpreter. If no native speaker for the language or recording studio is available, use the Speech2Go.online service instead. One important advantage of the service is that you may record additional text any time later, and sound, quality, tune of the voice will stay exactly identical. 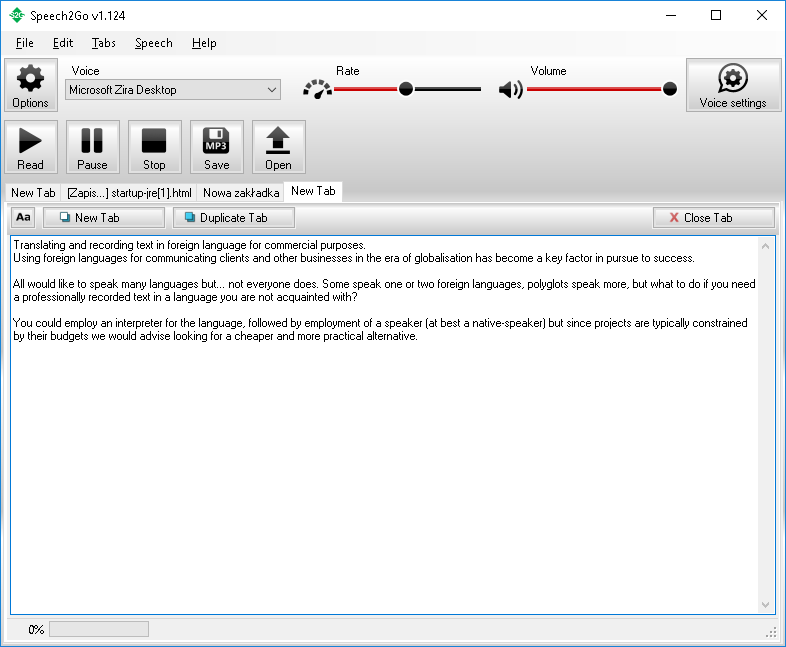 Speech2Go online service offers ability to record in many languages. Just anyone may record text in one of those languages and use it later for any purpose, including for commercial purposes, broadcasting, recording books (and even distribute them) etc. To make the recording enter or paste text into edit field at the My recordings page of the service, choose New recording, select a language and voice, other parameters (like velocity of speech) and hit the Record button. An MP3 file with the recording will be available soon and wait for you at My Recordings tab for next 12 months. By registering at the service you will get two credits good for recording two chunks of text up to 200 characters each. To use the service you don't need much experience or technical proficiency. It can be used from your computer, tablet or even smartphone. The only prerequisite is the Internet connection, all conversion is done at the service provider's server - it does not use your equipment's resources. The conversion uses well known, high quality IVONA voices and is fast - to convert a page it would take seconds only. As mentioned before - the audio acquired at Speech2Go.online can be used for any legal purpose - including commercial, broadcasting, sharing, etc. 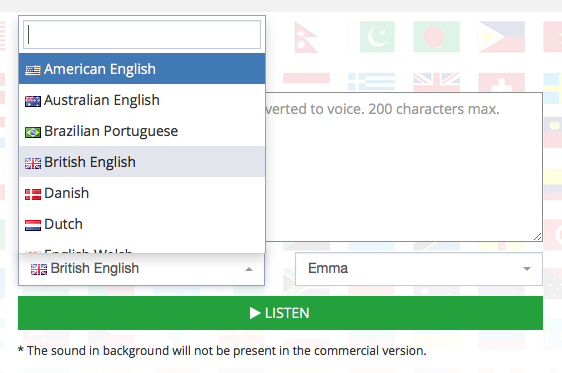 IVONA speech (that is used at Speech2Go online service) offers voices in 25 languages. If these languages do not cover your needs you may look at other possibility - purchasing a speech synthesiser at harposoftware.com - there are 150 voices available! You will need a Windows computer or tablet for that. Remember that you need to purchase Speech2Go + voice(s) package to record audio files (voice only packages don't feature audio file recording). Unfortunately - the installable voice license doesn't allow for commercial use. You cannot broadcast or transfer the files, they must be kept for you own use.